Last juli we made a calculation regarding the EROI of wind power, making some assumptions regarding the weight of the wind tower, see link below. Now we have more accurate data, coming from the implemented Gemini wind farm, consisting of 150 Siemens 4 MW wind turbines. One of these wind turbines weighs in total 1.347 ton max. Annual electricity production Gemini wind farm: 2.6 TWh. That would be 17,333 MWh per turbine annually or 47,487 kWh/turbine/day. We again apply 5555 kWh/ton energy cost in steel production or 7,483 MWh/turbine. Payback time in energy terms: 158 days. Assuming again the worst case scenario of having to transport iron ore from Australia to Europe: 1600 kWh/ton or another 1600 * 1347 = 2,155 MWh which corresponds to 2,155/17,333 = 45 days. Energy payback tower construction + transport iron ore from Australia: 203 days [*]. Assuming an economic life time of 30 years, we arrive at an EROI of 54. Ignored is here is the energy cost of maintenance and installation. And then there is storage. [*] – Note that after 30 years the energy to create a new turbine from the scrap steel of the old one is less than the energy required to create a wind tower + turbine from iron ore from Australia. There is no transport energy cost other than to bring the tower to a smelter in Europe and in general the energy cost to create steel from scrap metal is (much) lower than from ore. According to Wikipedia the energy required to produce 1 metric ton of steel from scrap metal in an arc furnace is merely 440 kWh/ton (theoretical minimum 300 kWh). It goes without saying that electricity from wind power and arc furnaces are a match made in heaven and can operate on moments when supply of electricity from power is high. In the link “EU Economic Papers” (p14) it is confirmed that the energy intensity of producing 1 ton of steel from ore is a factor of 10 more intensive than producing 1 ton of steel from scrap metal in an arc furnace. 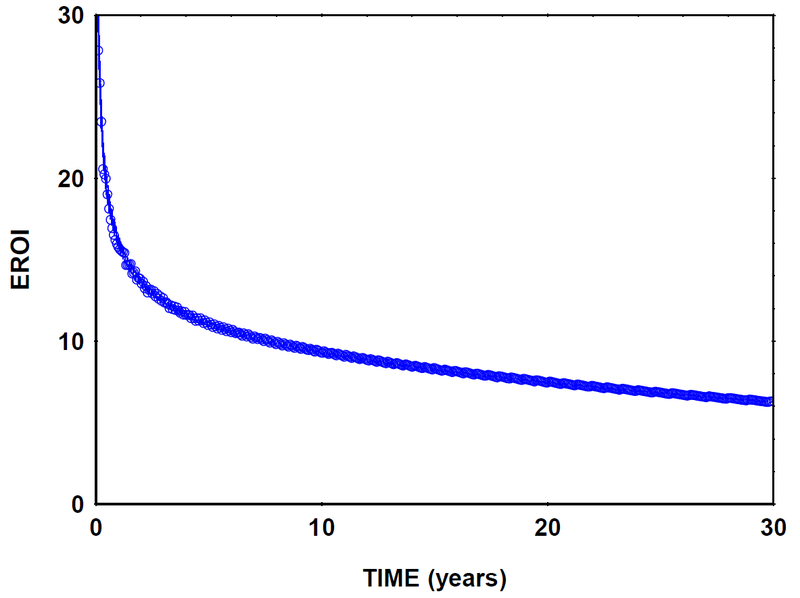 If you take this in account than it follows that the EROI of a wind tower produced from the scrap metal of a previous wind tower is in the order of 500-600 [**] rather than the values 54-60 we calculated for the “first generation” wind tower. In other words, the whole EROI discussion of wind energy is obsolete. If we recycle the old turbine we will have a vastly reduced embodied energy for the 2nd generation machine. But we need energy for extraction and transporting the tower back onshore. With maintenance remaining unchanged we arrive at an EROI of 51 instead of 32. But not “500-600”. Note that this is for a very conservative 20 years life time. So far, to our knowledge two windfarms have been decommissioned, one in Denmark and one in The Netherlands, both functioned for 24 years and there is no reason to assume they could not have functioned for many additional years. 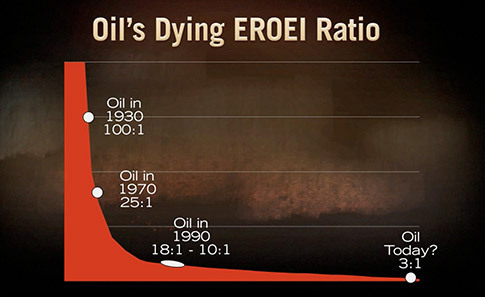 If lifetime would increase to 40 years you achieve a doubling of EROI (ignoring maintenance). [eia.gov] Over the coming 23 years energy intensity of steel production is expected to come down even further from 11 to 8 units or 27%. Improvements in PV technologies over the last decade have brought about notable increases in their EROI. 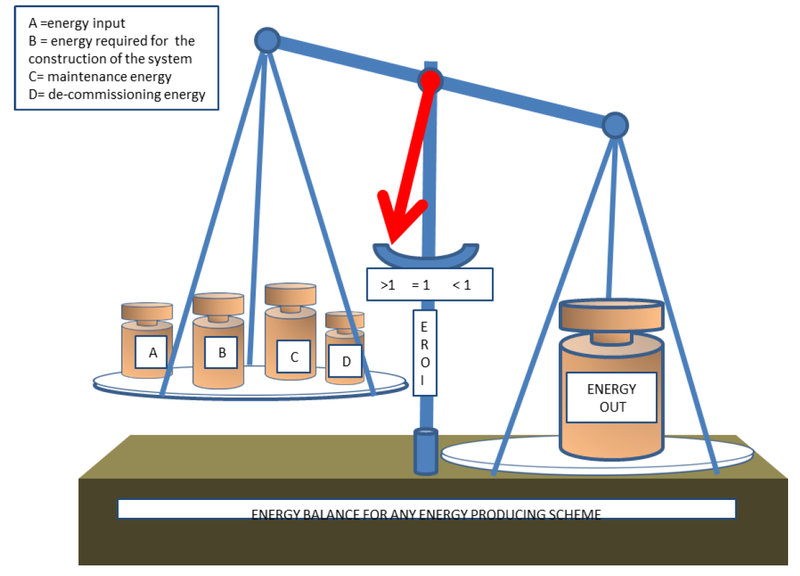 When calculated in terms of the electricity output per unit of primary energy invested (Eq. (2)), The EROIel of PV ranges from 6 to 12, which makes it directly comparable to that of conventional thermal electricity without CCS (4–24). When instead calculated according to the often employed formula EROIPE-eq=T/EPBT (Eq. (4)), i.e. 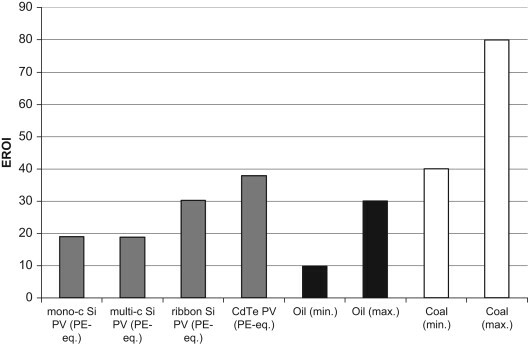 expressing the energy ‘returned’ by PV in terms of its ‘Primary Energy equivalent’, the EROI of PV is up to 19–38, which puts it squarely in the same range of EROI as conventional fossil fuels (oil in the range 10–30; coal in the range 40–80). These new results prove that PV is already a viable energy option that may effectively contribute to supporting our societal metabolism, while significantly reducing the depletion of the remaining stocks of non-renewable (fossil) primary energy, and mitigating the concurrent environmental impacts in terms of global warming and polluting emissions. However, even these remarkable results should not allow one to forget that PV, like all other renewable technologies, must still be supported by an initial investment of primary energy, which is, as of today, of fossil origin. We therefore argue that available monetary and energy resources should be funnelled in the right direction without delay, lest not enough high-EROI fossil fuels are left to support demand during times of gradual shift to renewable resources. [sciencedirect.com] – The energy return on energy investment (EROI) of photovoltaics: Methodology and comparisons with fossil fuel life cycles. June, 2012. Every now and then you hear the argument made that wind energy should be rejected on the grounds that wind turbines have a negative net energy, meaning that it would cost more to build a turbine than it will ever return in energy terms. 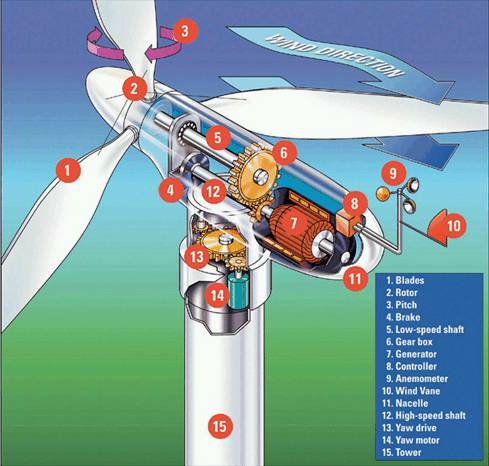 Additionally the claim is heard that fossil fuels are needed to build and maintain a wind turbine. Here is a US government (DoE) document specifying a standard 5 MW offshore wind turbine (“NREL offshore 5-MW baseline wind turbine”). That wikipedia article claims that the energy cost for one metric ton of steel is 440 kwh. 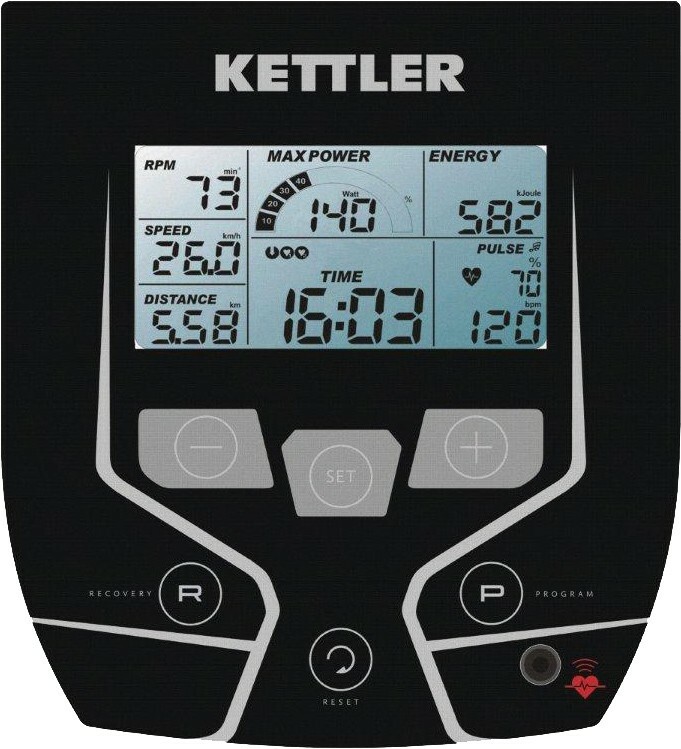 Applying this to the data of the standard wind turbine mentioned above, we arrive at 440 * 700 kWh = 300 MWh. This is the equivalent to the power production of the same 5 MW standard wind turbine of 12 days full power. Assume the requirement of 1000 ton of reinforced concrete for the foundation (obviously for onshore situation). From this source we learn that the energy cost 1 ton of reinforced concrete is 2.5 GJ. This comes down to ca. 6 days of windturbine operation at maximum power. That makes 18 days in total. Assume a more realistic load factor of 33%, we arrive at ca. 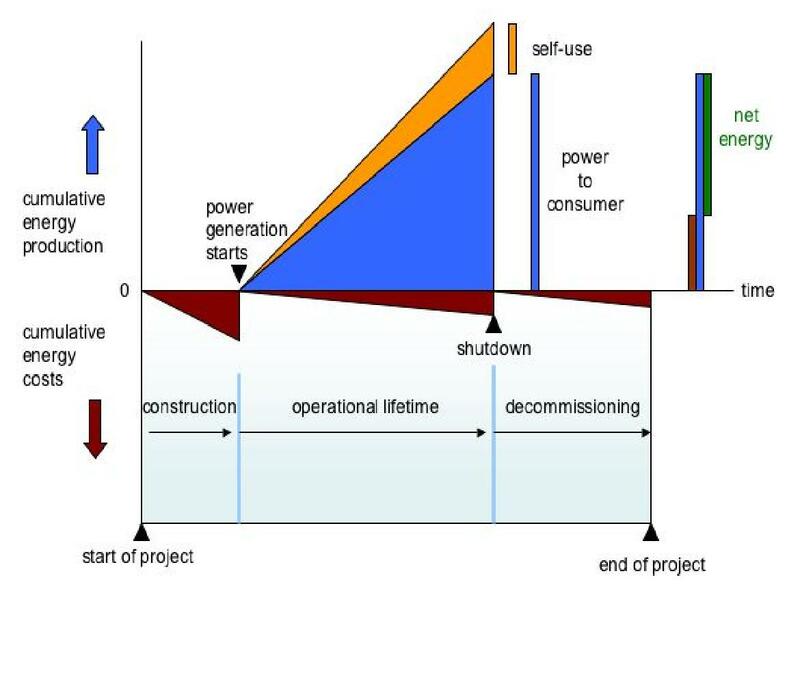 60 days of normal operation for the wind turbine to earn back the invested energy, after which the net energy harvesting starts. The tower will last centuries, blades and gearbox maybe 30 years. And again, the steel can be produced efficiently with electricity, no fossil fuel necessary. This calculation does not include gearbox and generator. Without these items, for a 30 years = 10,000 days, we arrive at an EROEI of 10k/60 = 160. Again, energy cost of gearbox and turbine are not included, as is road construction, transport and assembly. On the other hand the steel tower, representing half of the total steel mass of the turbine, is certainly not written off after 30 years (Eiffel tower was built in 1889 and is around already for 123 years, with no end in sight). 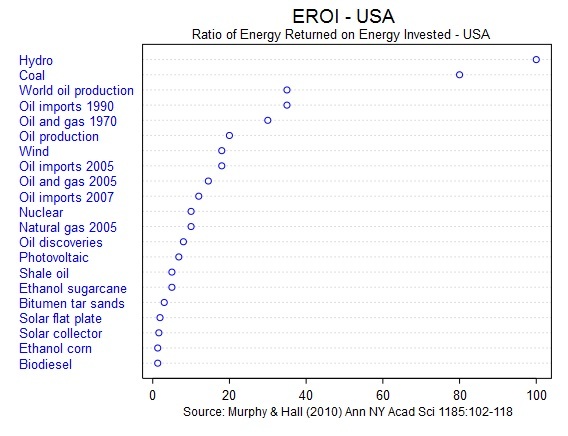 It seems that the EROEI value of 20, mentioned in the 2006 theoildrum article (see below), maybe applies to smaller windturbines, but probably is too pessimistic for large offshore windturbines. Wind energy: go for it. Substitution leads to: Net Energy = Eout*((EROI-1)/EROI) (see graph). EROI 100 means that if you put 1 potato in the ground you can harvest 100 next season. EROI 10 means that you must put 10 potatoes in the ground to harvest 100 next season. To put it differently: if your starting capital is 100 potatoes and EROI is 10, then you need to plant 10 potatoes and you can eat 90 in order to harvest 100 again and the cycle can start all over again in a sustainable way. In case of EROI 100 you only have to plant 1 potato and you can eat 99 to have 100 potatoes again in the next season. Comparing EROI 10 and 100 means incomes resp. of 90 and 99 potatoes, a difference of only 10% and not a factor of 10! 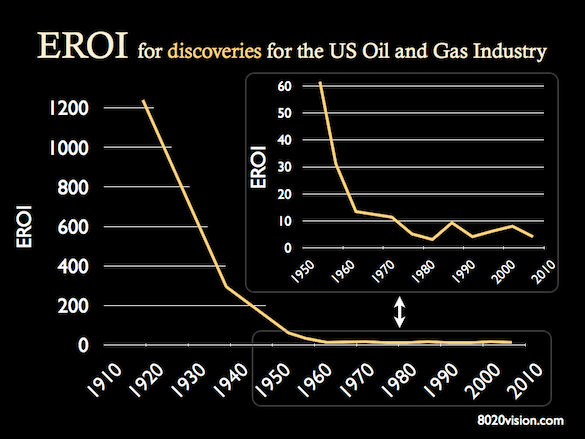 EROI applied to energy same story. In case of EROI ratio 15:5 the income difference is 14:12 or ca. 16%. Not that spectacular either. Youtube text: Professor Charles A. S. Hall speaks of his concept “Energy Return on Investment” (EROI) at a seminar arranged by think tank Global Challenge in Stockholm. Posted November 2012.